“I used to want to save the world. This beautiful place. But I knew so little then. It is a land of magic and wonder, worth cherishing in every way. But the closer you get, the more you see the great darkness simmering within. And mankind? Mankind is another story altogether. What one does when faced with the truth is more difficult than you think. I learnt this the hard way a long long time ago. And now I will never be the same.”- Diana Prince (Wonder Woman). A husky woman’s voice is heard telling us the above cited when Wonder Woman (2017) -the smashing movie- begins. It’s Diana Prince talking. With that words she says a lot of what she is and what she does as a super heroine and, also, as a regular citizen. We just had to pay attention. According to Apollo Magazine, Diana (only daughter of Queen Hippolyta of Temescyra) is “an ancient weapons specialist” working at the Louvre Museum (Paris). Certainly, we get to see her walking through its famous courtyard (Pei’s Pyramid included) and, a little later, at her office surrounded by several antique pieces. Mary Manning refers to Diana’s job as “curator at the Louvre”. Still from Wonder Woman (2017): Diana Prince walks through the Louvre’s famous courtyard. But according to the comic development of the character (#106 – February, 1996), Diana became a temporary resident of Gateway City and took a job as a visiting lecturer on Greco-Roman mythology at the local museum, which specialized in artifacts of ancient cultures. It seems the movie recalls this as the perfect job/disguise for the Princess of the Amazons. And it was a great choice! Even though not everybody is happy with Diana’s regular everyday job, it must be expressed that the she is an art historian or at least a professional in historical matters tied to the ancient past where she belongs herself. That would have been a random choice if it weren’t so closely related to other details in the movie. Let’s look at them one by one. In her opening statement, Diana tells us about discovery, about the awe of knowing something at last, about her capacity to recognize beauty, and her acknowledgement that truth has its difficulties. This could have been the words of anyone in the academic world. That opening statement comes with a view of the world as if the gods were looking at it. 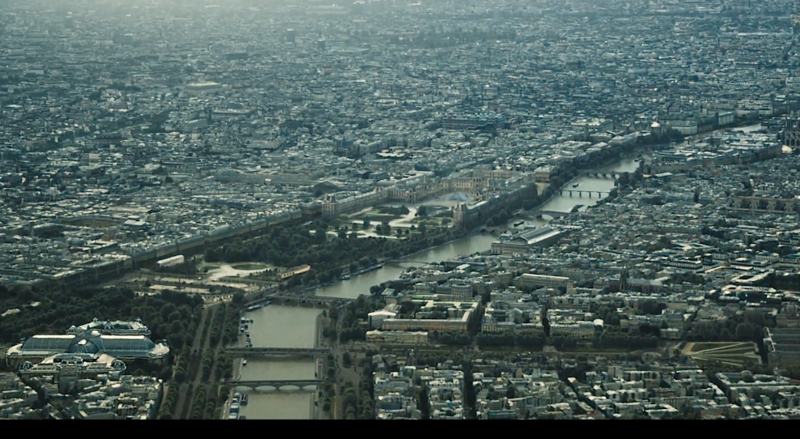 Of course, Diana is part of that godly sphere and she looks at “this beautiful place… a land of magic and wonder, worth cherishing in every way” from above getting closer and closer to Paris and the Louvre’s courtyard where we see her walking. It is a cinematic resource turned into a moral reminder: she is Wonder Woman and she is above us all, but she is still putting all the pieces together to understand this world. That last thing is what a historian does. She can see the amazing creation this world is together with Mankind. Even though Mankind “is another story altogether.” That story is told quickly by the antiques we can see in her office: shields, armors, swords, axes, all magnificent human creations of beauty, but also of violence. That is “the great darkness simmering within” she referred. An art historian does that everyday: to face the marvels of human creativity in the midst of turbulent cultural contexts past and present, trying to figure out Mankind at the end. Still from Wonder Woman (2017): Diana Prince at his Louvre’s office. The movie begins in present time as Diana goes back to her memories minutes later. To recall, revise and reflect about matters of the past is what a historian does. Working at the Louvre Museum as a curator of antiques is not a casual feature of the character Gal Gadot plays so properly, it is a statement of the character itself. Diana is not only Wonder Woman, she is a wise woman and it’s what all this is about. She confesses her original intentions towards Mankind and how they changed when she realized that there is not one facet, that there is light as there is darkness, being both truly human. This is something a historian learn sometimes the hard way as Diana has. But it never discourages. It pushes the historian forward to explore and discover. It makes him/her stay …and fight (with the archives and his/her own human nature) and give. I must confess it made me proud to see an art historian as a superhero, because I didn’t see it the other way around (a superhero being an art historian). Art History, contrary to Manning’s opinion, is not a luxury discipline. Instead, it’s a neglected one, and having a superhero in our shoes should be for all of us art historians of the world a very rewarding thing. And yes, to be an art historian you need special skills. That’s what makes it a remarkable profession. Well, Diana is the Princess of the Amazons, what would you expect? No one would excel her knowledge in this matter. Besides, she is also Wonder Woman. And I am delighted about it! In the movie, Diana reflects in the beginning as well as in the end on an old photograph (a common historical source as well a reknowned artistic expression). Being this a common human action, the dynamics of memory are, in this case, common to the historian and she seems to be comfortable with it. After all, she is not only a superhero, but an art historian. And like all of us, she is constantly reminded about cruelty and beauty in Mankind. So, let’s face it! Art History matters even to Wonder Woman.